Preheat the oven to fan-assisted 160C / 180C / 350F / gas 4 and lightly oil a lined baking tray. Heat the oil in a frying pan, add in the wild garlic and and stir fry until wilted. Remove from the heat and add to a large bowl. 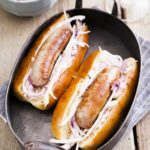 Split the sausage skins, remove the meat and add to the mixing bowl along with the oats. Mix until well combined. Transfer the thawed pastry sheet onto a lightly floured surface and cut into half lengthways. Shape half the sausage mix into a sausage and lay in the centre of the pastry sheet, all along the length of it. Brush the edges of the pastry sheet with the egg and roll the pastry so that it encloses the meat, forming a long sausage roll and use a fork to seal the join. Cut into 8 equal sized pieces (or 4 large ones if you prefer). Repeat with the remaining pastry sheet and sausage mix. 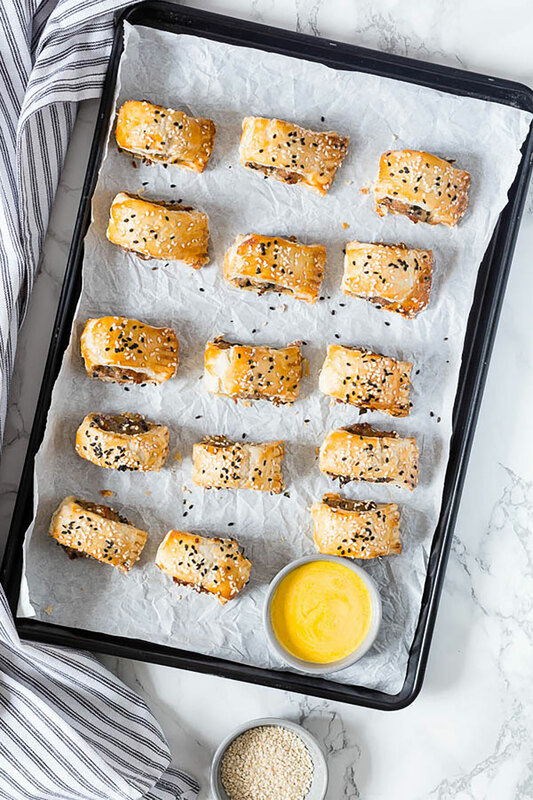 Transfer the sausage rolls onto the baking tray, brush with the beaten egg and sprinkle on the sesame seeds.